In the framed photo: my mom to the right, standing. 20 years of age. I have images from childhood burnt in my memory; some are memories of real-life events, others of vivid dreams I had at a very young age. I knew this first post should offer a glimpse of a food with a story that was an integral part of me and that illustrates the essence of being Indian and Jewish. Often I am asked what Indian Jewish food is, and often I answer: you take regional dishes and ingredients and tailor-fit them to Jewish dietary laws. Tweaking dishes or creating from locally sourced, available ingredients, your own dishes become a sort of fusion, based on your own religious and cultural traditions, rituals and needs, while respecting and trying not to offend the local customs and beliefs. A very personal kind of fusion cuisine. My mom and dad on their wedding day (1963). Growing up in Israel, in a predominantly Marathi-speaking Indian Jewish community, I knew of three Indian Jewish communities who were separate and distinct from each other. You can read a brief summary here. Later on, two more Indian Jewish communities were discovered in India. Our community, the B’nai Israel (sons of Israel), descendants of one of the lost tribes of Israel, was the largest and believed to have been shipwrecked at their eventual destination on the Konkan coast just south of Bombay in Maharashtra. Believed to have arrived in India before the destruction of the Second Temple in Jerusalem (70AD), legend has it that the prophet Elijah helped the small group washed onto the shores, known as the Shenwar Telis, or oil pressers, who did not work on the sabbath, practiced circumcision and recited the Shema. They lived in peace with their Muslim neighbors and never suffered persecution as a minority in an India that was majority Hindu. Later on, many moved from the villages on the Konkan Coast to Bombay. As the B’nai Israel population became urbanized, they rose high in the ranks of military, government, film, literature and poetry and scholarship. The majority of Indian Jews — about 60,000 — immigrated to Israel, and only about 5,000 of the B’nai Israel community are left in India, mostly in Bombay. Left with only the knowledge of the five books of the Bible, and mostly isolated from any news of developments out in the spiritual Jewish world, B’nai Israel continued the traditions and oral history carried down from generation to generation. The Siddur, or prayer book, was a transliteration of Hebrew written in Hindi characters. When we got married in Israel at an Indian synagogue, Jonathon was given a Siddur to follow the services; the only problem was it was written in Hindi characters. He couldn’t follow what was going on at his own wedding, although he had embraced the entire experience and culture way before I embraced the Indian in me. There were many parallels between Indian and Jewish traditions. A central ritual for both communities was offerings: in Hinduism, to many gods, and in Judaism, the offerings brought during the pilgrimage to the Temple in Jerusalem, and to a single God, Yahweh. To the best of my knowledge and experience, with many different Jewish communities from diverse ethnic backgrounds in Israel and in the United States, to this day, the B’nai Israel community is the only one carrying on that tradition. The offering was the Malida. Consequently the dish and the ritual were called interchangeably “Malida.” If there is a single dish that defines Indian Jewish cooking it is Malida. The dish is made of parched, flattened, thin rice flakes, called Poha, that are sweetened. Coconut, cardamon and thinly sliced, blanched almonds and pistachios are added to the sweetened Malida and piled on a thali with five fruits and vegetables (dates, bananas, oranges, apples or any other fruit in season), to pray over what God has given us from the earth and from the tree. Malida is celebrated mostly on joyous occasions — for bris (circumcision ceremony), engagement parties, henna ceremonies (which in Israel is not the actual wedding, but celebrated a day or a few days before the Jewish wedding), house-warming parties or graduations. When times are bad and you are down on your luck or encounter sickness in the family, you might have a Malida ceremony to turn the tide. Usually the women vow to fast and once the fast is completed, we celebrate with a Malida ceremony to mark the completion. If it is for a happy occasion, we use rosebuds as spices and perfume in the center of the Malida thali; if it’s a sad one, we use cloves. Elijah the Prophet is central to the ceremony. There is a prayer, a chant; some sing a hymn, and we recite from Elijah the Prophet during the ceremony. Elijah the Prophet is fundamental to B’nai Israel’s core Jewish beliefs and identity. This is me, one of a handful photos salvaged from my childhood. 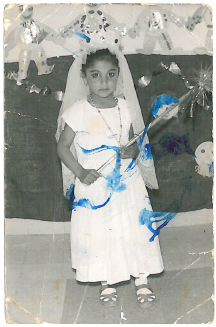 Dressed up as Queen Esther for Purim, I was a preschooler about 4-5 years of age. Imagine me, a wide-eyed little Indian girl experiencing all these life cycles, with the thread of Malida as a common denominator. These often took place in the cramped quarters of our apartment or at my grandmother’s place, or a neighbor’s, with 20 to 40 people at the time, blankets all spread on the floor and pillows propped up against the wall and spread across the floor. At least 10 adult men (defined as 13 or older, at least of bar mitzvah age) — including the Hazan (cantor) as a Minyan*, since the B’nai Israel community didn’t have any trained rabbis — conducted the Malida ceremony, with the men in the living room and the women in the kitchen, bedrooms and porch, and loads of kids running to and fro, making quite a commotion. The Malida dish is served after all the blessings and a full Indian meal of curry and rice was served shortly thereafter. With so much going on, there was sometimes drama, needless to say. Many non-Jewish Indians I have met over the years had poha as a savory not a sweet dish. I believe a sweetened poha dish (the Malida) is a distinctly South Indian specialty, similar to a morning cereal. At a Challah and Chutney Cooking Demonstration and Tasting I was invited to host at Sixth and I Historic synagogue in Washington D.C., the audience of 60 or so was not necessarily all Jewish. I would estimate half were Jewish and half not, but a few in the crowd were Indians, and grew up with the same food I did or at least a version of it, and they could have potentially been my biggest critics. As it turned out they were gracious and complimentary of all the dishes they tasted, and were in fact surprised, as they had only eaten savory poha, never sweet. Note: I make the dish at home and serve it at tastings, without nuts and edemame, and everyone loves it. Also keep in mind these are suggested measurements. If you like it sweeter, add sugar. Feel free to adjust measurements to your taste. Immerse Poha in cold water for four minutes until softens. Keep in mind some like it al dente, crunchy, I don’t! Be sure not to over soak and turn mushy and flake will lose its silhouette. Run through a sieve to drain all water out and press on top lightly to rid of excess water. In a large bowl, add the drained Poha and sugar and flake with a fork or with your fingers to fluff the mixture. Important: Add the sugar immediately so it will blend in smoothly and not remain grainy. Add the cardamon and coconut and mix well. Note: I only use my hands or a fork to keep the integrity of the shape of the flake. Garnish with nut, edemame and golden raisins. Keep refrigerated until serving. Can keep in refrigerator for a few days. *Minyan: Ten adult (post-bar mitzvah, over age of 13) males needed to proceed with prayers. Reform and some conservative movements count women. Many thanks to my friend An @bakerstreet29 with the help as I was writing this post! You can follow my food meandering on Twitter @FoodWanderings.